You don’t often think of Twitter as a photo-sharing service, but that is certainly a major part of the features it offers, especially since rolling out pretty slick user galleries back in August. You can also search for images and videos shared on the social network directly on the site. But on the go, using your iPhone or iPad, the official Twitter accounts make it impossible to search for images, and that’s where the new app, SnapNest, comes in. With the app, you can search for images using specific keywords, check out images related to trending topics or, by using the iPhone’s location awareness, you can also search for images in your vicinity. On first loading the app, you’re met with a list of the trending topics and a space to search for images of your choice. Once you perform a search, images are displayed in a grid. 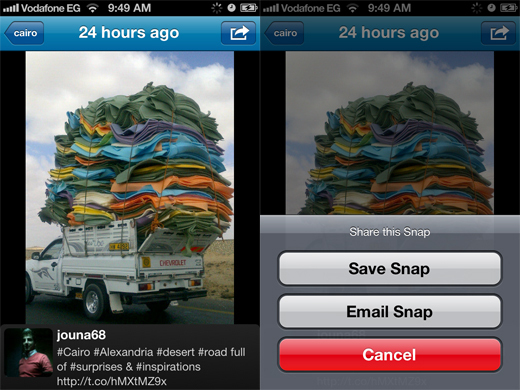 What’s really cool about how SnapNest works is that it performs searches in realtime. So if a new image is posted to Twitter associated with your search term, it will automatically be displayed in your search results. 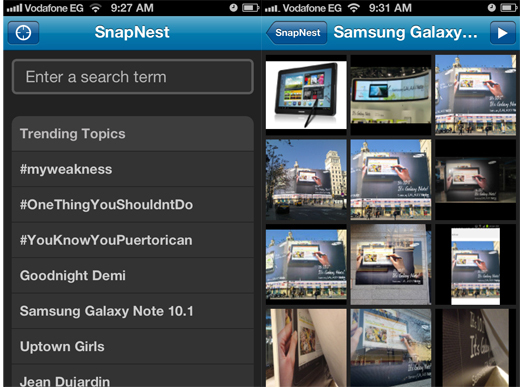 SnapNest also gives you the option to pause realtime search as you’re scrolling through your results. Opening an image, the tweet it’s associated with is displayed beneath the picture. You can save the image to your camera roll or share it via email. The app does have one odd little quirk. When you come to share an image, if you hit cancel, it automatically loads the iPhone Facebook app, with a link pasted into a new status update box. The image is then shared as a link on your Facebook profile, but the image itself isn’t displayed. Can you think of any great ways to search Twitter for images on the go? Let us know in the comments.